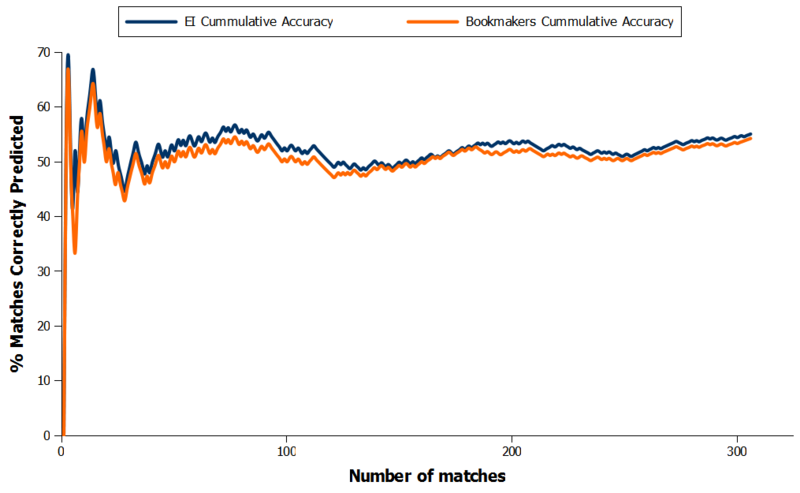 A couple of weeks back I demonstrated how the EI is more accurate than the bookies based on rank probability scores but a few people have asked if I can do something a bit simpler so Figure 1 shows how often the EI picked the winner as being the favourite compared with aggregated bookmaker’s odds. It’s pretty close but the EI seems to have a small but reasonably constant margin over the bookmaker so far this season. Last week turned out to be a pretty good week with the EI managing to correctly predict the winner in eight out of the ten matches played. I’d made a few minor tweaks before posting last week’s odds to try and enhance the the way draws and away wins are calculated so hopefully the EI will be able to maintain its edge over the bookmakers. Just wondered if you considered your Liverpool-West Ham prediction as a success versus the bookmakers. I ask as although you suggest Liverpool are the most likely winners (66%) the odds makers priced them up as 1/3 (75%) chances. So in that case would you say your data would trigger a lay of Liverpool at 1/3 rather than a back? That’s an interesting point. I am still working on what is the best strategy to use with the model. Ideally I will be able to identify a pattern between where my odds diverge from the bookmakers and from there work out where the real value lies. Liverpool’s odds from the bookmakers are always a little strange though as they supposedly get bet on very heavily from Asia, which leads to the odds moving towards Liverpool so I suspect they were rated more likely to win than they actually were by the bookmakers.